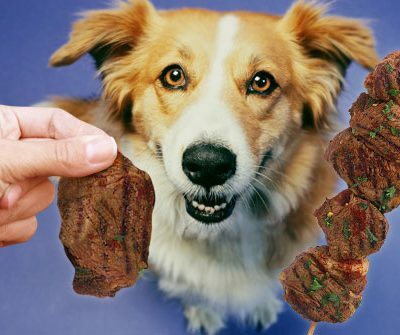 People food like steak makes a tasty treat for dogs and a supplement to a healthy home-cooked meal. Dogs may eat raw or cooked steak, but if you’re just transitioning your dog to people food, cooking the meat may make it easier. Step 1. Pat dry a boneless piece of steak using a paper towel. For pan-searing, use a steak up to 2 inches thick. Season the dry steak with salt and pepper, then add a thin layer of olive oil. Avoid the temptation to get creative with seasoning and stick to plain S&P; some spices, such as garlic, are toxic to dogs. Step 2. Heat a skillet or griddle over medium-high heat. To test your skillet, touch one edge of the steak to a corner of the pan. When the griddle is ready, the raw steak should begin to sizzle. If the steak makes no sound, the pan isn’t ready. Once your skillet is fully heated, lay the steak in the center of the pan. Step 3. Cook the steak for five minutes to get a nice sear on the meat. After five minutes, turn the steak over. Allow the other side to cook for about five minutes to get a medium steak perfect for your pooch. Step 4. Lift the steak out of the pan and place on a cutting board. Allow the steak to cool, covered for up to 10 minutes. Step 5. Cut the steak into small pieces so your pup can eat it. Sure, your pup could wolf down the steak, but this makes it easier for him to eat and ease digestion. Placing the bites on a large tray will slow him, as will placing a tennis ball or two in his bowl along with the food. Step 6. Give your pup some of the steak. Meat should make up 25 to 50 percent of a dog’s meal. To round out the meal, offer other people foods that dogs can eat, such as carrots, green beans, broccoli or leafy green veggies. If you have any questions or comments, feel free to contact us here at Ruffger’s. Happy cooking!